Join the family of FON, the search. Two month ago I wrote about FON, a Spanish initiative to provide members of the FON community with world wide free WiFi access to the InterNet on the basis of reciprocity. This is a sequel, a diary of a trip where as a side issue, I tried to find and use FON access points. August was very wet and so we aborted our previously planned trip into Germany following our stay at the Bad Bentheim international Hamfest. Instead we decided to wait out the bad weather at home and start over when the conditions became better. I decided to take the laptop along with FidoNet point software installed and try to find FON access point to keep in touch. But how to find them? It turned out to be not as easy as it looked at first sight. Fon offers maps based on Googlemaps with the FON points inserted, but these are of little use if you do not have advance knowledge of where exactly you are going. Now this may seem a bit odd for most of you, but for us Dutch trailer/camper owners - we call them caravans here - it is not all that unusual to just hook up the trailer and go without any more than a vague idea of where the trip will go, let alone where it will end. Some of us are true nomads. FON offered - they dropped that recently - the possibility of displaying a list of nearest points around a selected ZIP code, but only the first 30 or so of that list are printable. So I printed a list for two cities I thought I might come near: Middelburg in Zeeland and Antwerp in Belgium. Some 60 FON points in total. Our idea was to eventually go into France, maybe Normandy or even Brittany, but printing lists for all that was just too much, so I gave up. Friday Sept 8, 2006. We hooked up the caravan and headed in the direction of Zeeland. We saw some interesting things on the way and arrived at a camping place near Renesse in the evening. No FON points in the neighbourhood, but as a ham I am always on the lookout for antennas. 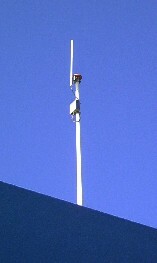 I noticed a small vertical antenna on a flag pole near the shower block. A bit shorter than a 1/4 wave for 2 meters and a bit thicker than a simple rod. Later I also saw the same antenna on the flag pole at the reception and so I asked the receptionist what they were for and my guess was confirmed: WiFi. When I asked how I could get access the man told me that since "the router was broken, the network was all open and access was temporarily free". That did not sound very logical to me - if the router is broken, how can it work at all? - but who am I to argue with a free lunch. And indeed, it was an open network and I succeeded in having my binkp mailer on the laptop make contact with my system at home and I exchanged mail. So far so good. But this story is about FON and not about an accidentally free access point on a camping. Saturday Sept 9th. Next stop Zoutelande. No Wifi on the camping, no registered Fonero within 15 kilometers. We did some shopping and made a trip to Veere, A very nice old city. Bit of a tourist attraction though. There is a marina there and I noticed a WiFi access point on the harbour master's office. I guessed this one would not be open and it certainly was not a registered FON point, so I did not take the trouble of going back to the parking (300 meters) to get the laptop and try it out. Sunday Sept 10th. The camping place at Zoutelande turned out to be a nice place and there were lots of trips to be made, so we decided to stay there for a few more days. We made a trip to Middelburg and enjoyed ourselves at "little Walcheren". Got plenty of suggestions for things to go see in the real. There are four FON points listed in Middelburg, but frankly we were a bit tired and hungry at the end of the day. I didn't have the drive to go for an access point hunt, so we went back to the camping for a meal. Monday Sept 11th. Trip to Vlissingen. Home of the famous Dutch admiral Michiel de Ruyter (I am named after him). There should have been one Fonero in the city. This time I thought I would give it a try. I had little trouble finding the address and I could even park there for a moment. There was a signal but it was not on the expected channel 11 - the default for the FON social router - and it was protected. No access. So the guy had switched off the social router. Maybe he got tired of it and replaced the FON software in the router with the original Linksys software, or it was the neighbour's router or something else. Anyway, I did not want to stay to investigate, I could not park there for long so we moved on. Tuesday Sept 12th. We hookup up the trailer again and went for Goes. There should be four Fonero in Goes. With the caravan hooked up, going into the city Was a bit of an adventure. I had little trouble finding the first address, but I ran into a dead end street and it took a bit of effort to turn the combination around without unhooking the trailer but I managed. Luck was with me this time, I got a signal on channel 11. It looked promising. I got access and exchanged mail. what I had expected did not happen however: I was not asked for a user name and password. This appeared to be an open access point. I was not sure because my experience with FON access points was very limited. Maybe a cookie did the login for me. Who knows? Later when I had an opPortunity to consult the travel log, I saw that it had indeed not been a FON access point. If it were, it would have appeared in the log. I had just stumbled on an open access point. Maybe operated by the Fonero, maybe his neighbOur. I did not stay around to investigete, I was parked a bit akward and Rosa felt uncomfortable and became impatient. So we moved on and settled down at a camping at Wemeldinge. Wednesday Sept 13th. The camping at Wemeldinge offered no WiFi and there were no FON access points within 10 km. The place was presented as a diver's Walhalla and maybe it was, there were plenty of wet suits to be seen. But as diving is not our thing and it had little else to offer, we hooked up the caravan again and moved on. We took the Zeeland tunnel across the Wester Schelde and settled down at Groede near Breskens, Zeeuws Vlaanderen. No Wifi on the camping there and no Fonero in range. We planned to go south along the Belgian and French coast next day. Thursday Sept 14th. The weather turned bad, so we decided to abort the plan of going down the coast and turned east at Brugge instead. We expected better weather away from the coast. We landed on a place called Oteppe in the French speaking part of Belgium. I had driven off the Fonero maps I prepared, so no chance of finding a Fonero. No Wifi signal on the camping but the flyer said they had InterNet capability. So I enquired and it turned out that I could use the computer of the "Internet Cafe" at the reception. No good of course, that one does not have binkp installed. When I asked if I could plug my RJ45 into a free port of the router I got a blank stare and when I explained, the lady at the desk almost got a hearth attack. So I gave up. The weather was nice though and there was a lot to see so we stayed a bit longer. Friday Sept 15th. We made a trip to Huy and visited the fortress. Very impressive. By then I had given up hope of finding FON access points. They are too sparsely spread to make the chance of accidentally bumping into them next to zero and I had no FON map of the area. Saturday Sept 16th. We saw a variety of impressive castles, but - this is getting boring - no FON access points. Sunday Sept 17th. The weather turned bad again and we had a problem with the car. No way to get it repaired on a Sunday, so we decided to call it quits and drive home while we still could. We took our time and made a few stops on the way. We were home just after sunset. My FON point at home ws still up and running. Nobody seemed to have used it. We had an interesting trip. Bit shorter than we planned but we enjoyed ourselves. As a FON expedition I can hardly call it a success. On a ten day trip with 1000 km on the meter, I did not contact a single Fonero. I realise that FON is just starting but for it to become a success as a first priority something will have to be done to make them easier to find. There are too few of them, they are too far apart and they are to hard too find when on the move. Plus that not all the registered ones are on-line. When we are on holiday, we do not want to spend the better part of the day dragging the laptop along, trying to find an active access point do we? They should be as easy to find as a gas station. 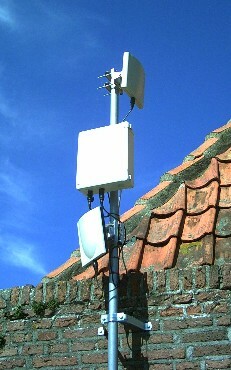 A weak point of FON is that most access points are where the Foneros live: in build up residential areas. The nomad - to whom it would potentially be most useful - is in a motel or a camping place. That is a bad match. I do not know if these problems can be overcome. Fon has recently changed their web interface with the Google maps. The new interface is much more flashy, but unfortunately it is also harder to find the Foneros than with the old interface. Not an improvement IMNSHO. We will just have to exert some patience and see how it works out. The more people who join, the more chance of success. This article was first published in FidoNews , Sept, 25th 2006. FidoNews is the official newsletter of the FidoNet community. First published Sept 25 2006 | last changed April 21, 2011.